This course presents an overview of all the factors that affect the design and operation of satellites and spacecraft, starting with a historical review of manned and unmanned spacecraft, and followed by current designs and future concepts. Lectures explore all the design drivers, including launch, on-orbit environment, trajectories, and atmospheric entry as well as launch vehicle engineering and its effect on the spacecraft design. Instruction presents orbital mechanics in a manner that provides an easy understanding of underlying principles, as well as such applications as maneuvering, transfers, rendezvous, and interplanetary transfers. 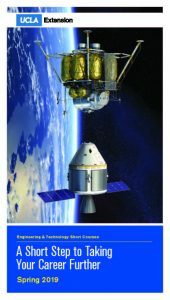 The course defines the systems engineering aspects of spacecraft design, including the design and incorporation of the payload, the various spacecraft bus components and the relationship to ground control. Instruction then details design considerations, such as structures and mechanisms, attitude sensing and control, thermal effects and life support, propulsion systems, power generation and storage, telecommunications, and command and data handling. Other topics include practical aspects such as fabrication, cost estimation, and testing, while examples of spacecraft failures lend insight into best practices for design. A number of videos illustrating different concepts supplement lectures, and participants receive a DVD containing an extensive set of design data along with class notes. This course benefits both Engineers with a particular specialty as well as scientists or instrument specialists who need to obtain a solid background in the “big picture” of spacecraft design and how the pieces of the puzzle must fit together. Managers who want to understand the many aspects of spacecraft design that affect their work, tasks, and scheduling also benefit from this course. Participants receive lecture notes on the first day of the course. These notes are for participants only and are not otherwise available for sale or unauthorized distribution. Donald L. Edberg, PhD, Professor of Aerospace Engineering, California State Polytechnic University, Pomona. Dr. Edberg has over 24 years of experience in the aerospace industry and has been employed at General Dynamics, the Jet Propulsion Laboratory, AeroVironment, McDonnell Douglas, and the Boeing Company, where he was a Technical Fellow. He currently teaches astronautics and aerospace vehicle design full-time at Cal Poly Pomona and is the director of its Space and Launch Vehicle Laboratory and Uninhabited Aerospace Vehicle Laboratory. He also has taught aircraft, spacecraft, and structural design courses at UCLA, UC San Diego, and UC Irvine, and has consulted for a number of small companies. During his career, Dr. Edberg has worked on launch vehicle and on-orbit space environments, aerodynamic testing of launch vehicles at high angles of attack, experimental modal and dynamic analysis, launch vehicle load mitigation, reduction of on-orbit mechanical vibrations, and microgravity isolation systems, as well as the development of an electric-powered, backpackable UAV in service as the FQM-151 Pointer. He holds 10 U.S. patents in aerospace and related fields, and was the inventor of and chief engineer for the patented McDonnell Douglas STABLE (Suppression of Transient Acceleration by Levitation Evaluation) vibration isolation system. STABLE was successfully demonstrated during the flight of Space Shuttle flight STS-73 carrying USML-2 in October 1995. Dr. Edberg is an Associate Fellow of the American Institute of Aeronautics and Astronautics (AIAA) and an active UAV pilot.